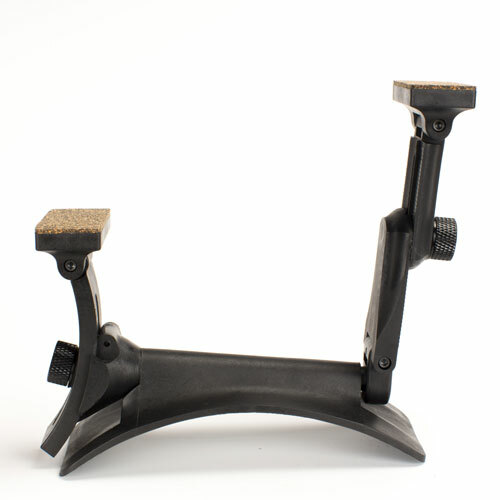 For a chart that compares all of our guitar supports, visit our Best Guitar Support Guide. The Short Model of the SageWork (formerly Barnett) Umbra Guitar Support is the slightly smaller sibling of the SageWork Umbra Standard Model, lifting the guitar off your leg about one inch less in any given position. It’s designed for younger or shorter players, flamenco artists, steel string players, and guitarists who require only minor instrument elevation. SageWork products are the only supports that attach to your guitar with magnets. Once you find the perfect position for the support, you simply attach two high strength magnets inside your guitar along the lower bout with removable 3M Command Strips. With the magnets in place, the support attaches to the exact same spot on your guitar every time. It attaches and detaches very easily. The unique use of magnets makes the initial installation a little more involved, but has many advantages. 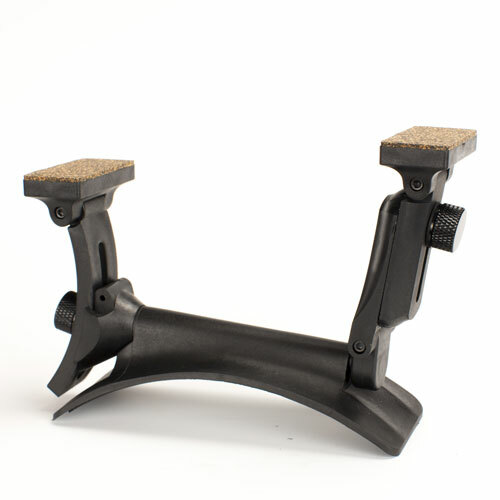 Most important, it ensures a more secure, reliable connection between the support and your guitar than suction cups or some clamps. Want to use the support on a second guitar? Just buy a separate SageWork Internal Magnet Set, install the magnets on the inside of the second guitar, and move the support (it just takes seconds). Four separate mechanisms allow you to adjust your guitar's angle, height, horizontal position, and tilt toward/away from your body. You can adjust the support for left or right leg playing styles. With so many adjustments possible, this support accommodates a wide variety of positions - even the cello-style position of Paul Galbraith. 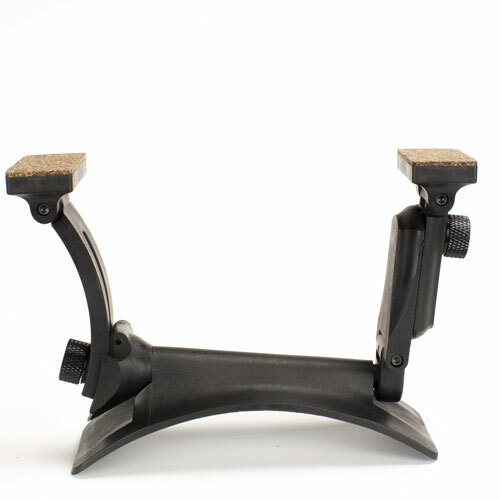 And unlike some guitar supports, it works for left-handed guitarists without any modifications. At the lowest setting, the support lifts the guitar off your leg between 2 inches (steep angle) and 4 inches (minimum angle). At the highest setting, it lifts the guitar between 5 inches (steep angle) and 6 inches (minimum angle). Pictures in our Best Guitar Support Guide show these heights and angles. A padded, slip resistant leg rest provides comfort and stability. In addition, the support's protective cork pads that attach to your guitar will not chemically react with its finish. The SageWork Umbra Short Model is collapsible and portable. It fits in the storage compartment of most guitar cases with all of the settings intact. As with any accessory that attaches to your guitar, you should make sure that your instrument's finish has cured at least six months before using this support. We also recommend that you remove supports and other detachable accessories from your guitar after each use. You should not use this product if you have a pacemaker or implantable cardioverter defibrillator, since the magnets may interfere with its operation. Order was well packaged and arrived in a timely maner. Works great. I already own 4 of these. I originally purchased one and a few extra magnets thinking I'd just move it around from guitar to guitar. However, each of these guitars gets frequent use, so I finally decided I wanted a dedicated support for each of them so as not to have to switch and adjust them for each instrument. I love them so much I actually have the magnets taped with 3M outdoor mounting tape to the outside of my Godin Multiac (a guitar with no sound hole) because it makes it so much more comfortable to play. 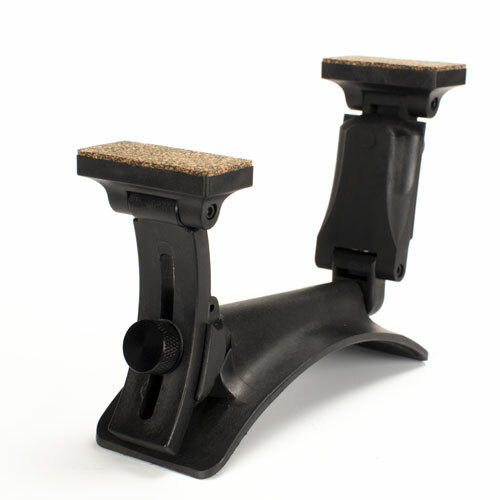 I have used other guitar supports in the past, mainly ErgoPlay. Those are nice for what they are, but the SageWork supports are the way to go if it's something you plan to use daily without worries about them falling off the instrument. Both versions, wood and plastic, look very modern and professional when attached. I honestly can't imagine going without one and will probably purchase another for any other guitars I purchase in the future. Thank you SageWork and Strings By Mail for making and supplying great products. And I dont just mean the Umbra Support, the folks at SBM were also very helpful with my purchase as I had to send back the regular sized Umbra as its lowest setting was still a bit too high for my taste. The short version works great and eliminates the need for a foot stool which means once its adjusted to your taste (And man, are the adjustment options amazing on this thing!) you can pretty much carry the guitar anywhere and just sit and play with both feet comfortably on the floor!